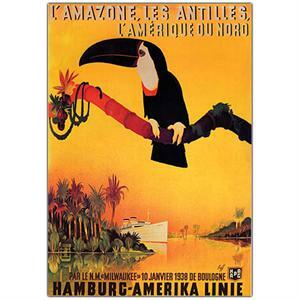 Product Type: Framed Canvas ArtArtist: Peter Fussey Title: L'Amazone, les Antilles, L'Amerique du noroFrame Dimensions: 18x24 inchesStyle: TraditionalFormat: VerticalSize: MediumSubject: VintageProduct Type: Giclee on Canvas*Gicl�e (jee-clay) is an advanced printmaking process for creating high quality fine art reproductions. The attainable excellence that Gicl�e printmaking affords makes the reproduction virtually indistinguishable from the original artwork. The result is wide acceptance of Gicl�es by galleries, museums, and private collectors.